NEARLY EVERY COMMUNITY, from the smallest to the largest, has a veterans’ memorial. And that is good, for honoring those who have served our country is worthy. Often, though, these memorials are costly. So individual bricks or pavers are sold, fundraisers held, donations solicited to cover expenses. This, too is admirable, to garner that personal and community involvement, support and ownership. But sometimes it is the simplest idea, the one that does not cost a great deal of money, which most impresses. Patriotism is evident in downtown Montgomery. 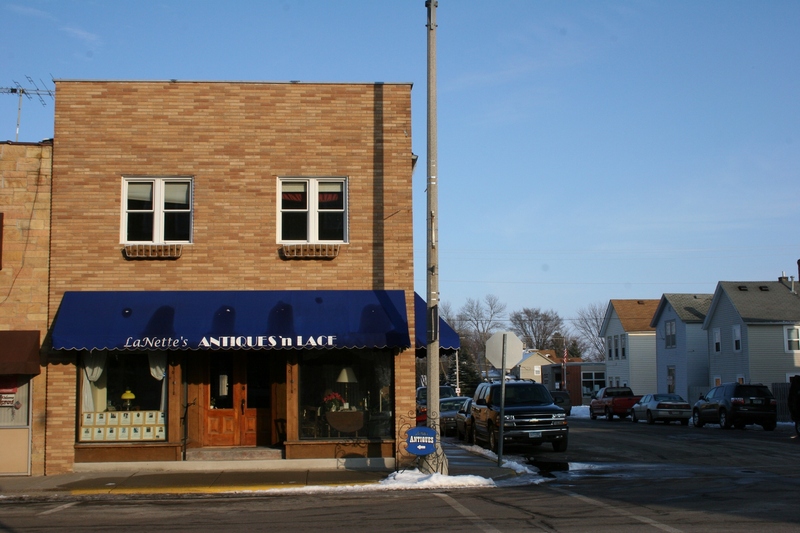 In Montgomery, Minnesota, you will find Veteran’s Memorial Park with its soldier and eagle statues, granite monument, inscribed brick pavers, park benches, flags and more. 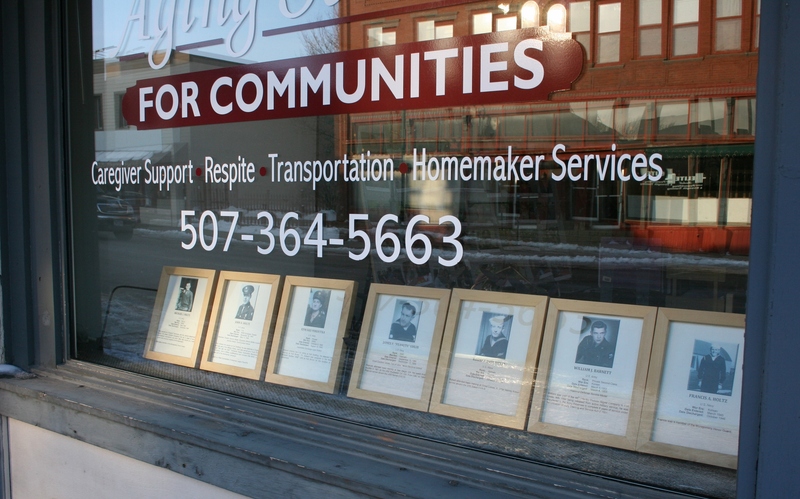 Veterans’ photos and information in the window of Aging Services. But you will also find, in the vet’s park and primarily in the heart of downtown, the photos and stories of Montgomery’s veterans printed, framed and showcased. It is a simple, but deeply personal and moving, way to honor hometown men and women who have served in the military. If you look closely, you can see the veterans’ tributes in the lower windows of Hilltop Hall. I happened upon the Montgomery Veteran’s Project on a recent Sunday afternoon visit to see Curtain Call Theatre’s performance of “On Golden Pond” at historic Hilltop Hall. (Click here to read a previous post about Hilltop.) On Hilltop’s lower level, in the windows of Posy Pantry and the Montgomery Arts & Heritage Center, I first noticed the framed veterans’ tributes. 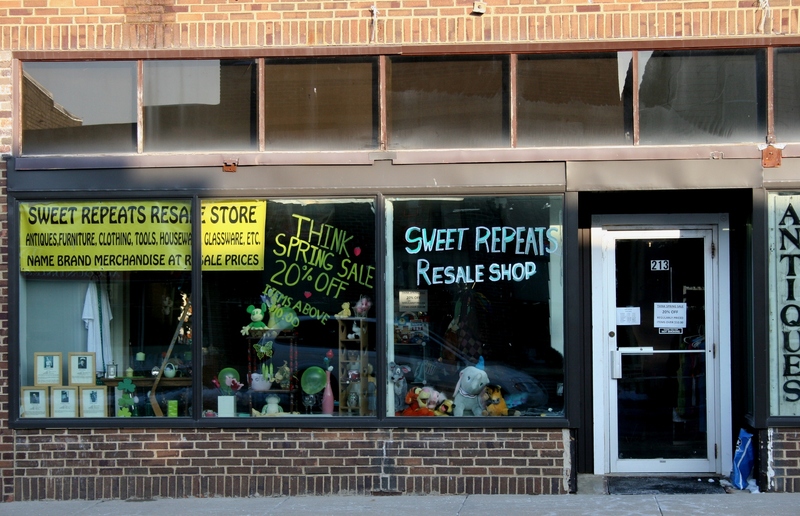 In the lower left corner you can see veterans’ tributes in the window of Sweet Repeats Resale Shop. But not until after the play, on a tour through the downtown, did I realize the scope of this project. Everywhere—from business storefront windows to exterior building walls—I spotted veterans’ photos and information, 279 total. 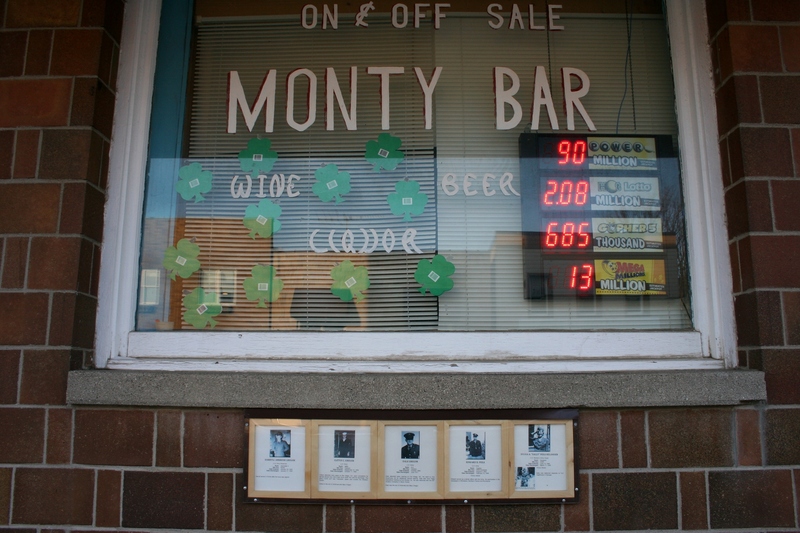 Honoring veterans at the Monty Bar. 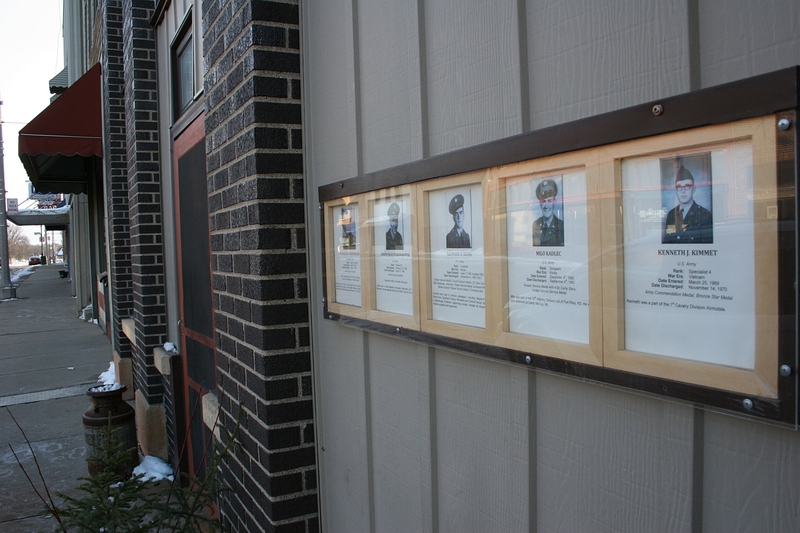 Framed and secured to the brick wall below a window at the Monty Bar are the pictures and military backgrounds of Cletus C., Dale and Darryll A. Gregor; Edward D. Pexa; and Sylvia A. Pexa Relander. Veterans photos and info posted at Dvorak Accounting & Tax. Propped against a window at Dvorak Accounting & Tax, framed memorials reveal that George O. Dvorak was among the first troops sent to Europe in 1917. George H. Dvorak serviced communications equipment while supporting the 35th Tank Division in Korea. More tributes on the exterior of the Happy Hour Bar. Over at the Happy Hour Bar, I learn that Milo Kadlec, part of the 10th Infantry Division, received the Korean Service Medal with four Bronze Stars and the United Nations Service Medal. To see these photos, to read this information, truly allows me to view these veterans as individuals, as hometown men and women who left rural Minnesota to serve in the U.S. and abroad. More personal memorials grace the windows of La Nette’s Antiques’n Lace. But how did this project come to be, I wondered. When interviewing Montgomery entrepreneur and Hilltop Hall owner John Grimm, I asked him about the framed veterans photos. Grimm, an Air Force instructor pilot in Texas during the Vietnam War, had seen a similar tribute at a veterans’ memorial in his hometown of Wautoma, Wisconsin, and suggested that Montgomery establish such a personalized memorial. That was nearly three years ago. 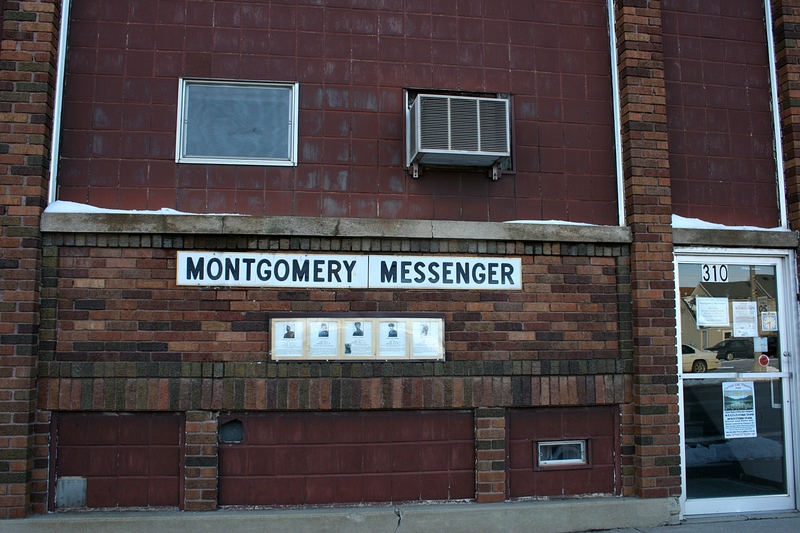 Several vets’ photos hang on the exterior of the local newspaper office, The Montgomery Messenger. Initially coordinated by Mobilize Montgomery, the installation of these individualized memorials is now handled by local American Legion Post 79. For a suggested $25 donation to defray printing, frame and display case costs, families can honor their loved ones via a personalized tribute. That’s not a lot of money for the front and center memorials embraced by a patriotic community proud of those who served their country. A portion of the promotional brochure from The Harbor. Courtesy of John Grimm. 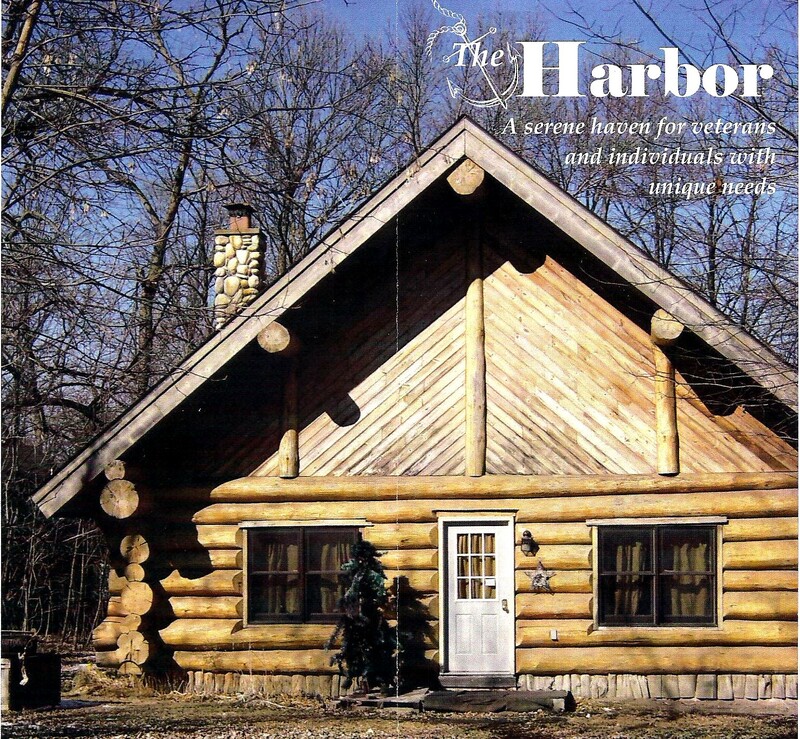 The Harbor features three log cabins and a central facility which can house a total of 14 on the 20-acre wooded, lakeside property. His goal, Grimm says, is to negotiate individual rental rates based on whatever is reasonable and affordable to the renter and will work for him to keep the haven financially solvent. This Vietnam War era veteran, who previously operated a Montgomery area assisted living facility, tells of a call he received about a 52-year-old homeless veteran while The Harbor was in the beginning of renovation. He thought about the housing request for awhile and decided if the vet had to choose between living under a bridge and living in a mess, he’d likely choose the mess. Turns out the vet had been a sheetrocker, so he moved into The Harbor in July to help tape and seam sheetrock. 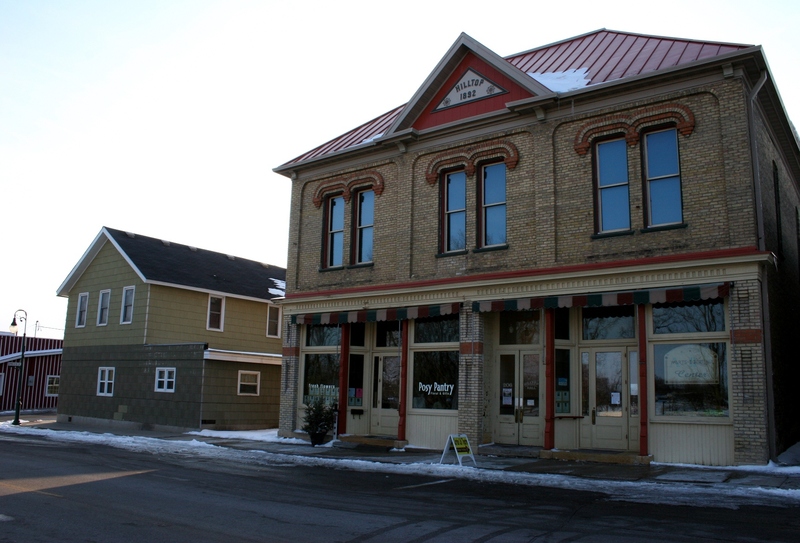 THERE, DEAR READERS, are two feel-good stories from one small Minnesota town, stories I discovered because I took the time to really look at Montgomery, to see the veterans’ tributes, and then to inquire about them. These discoveries await you at every turn. Just slow down, and you will see them, too. 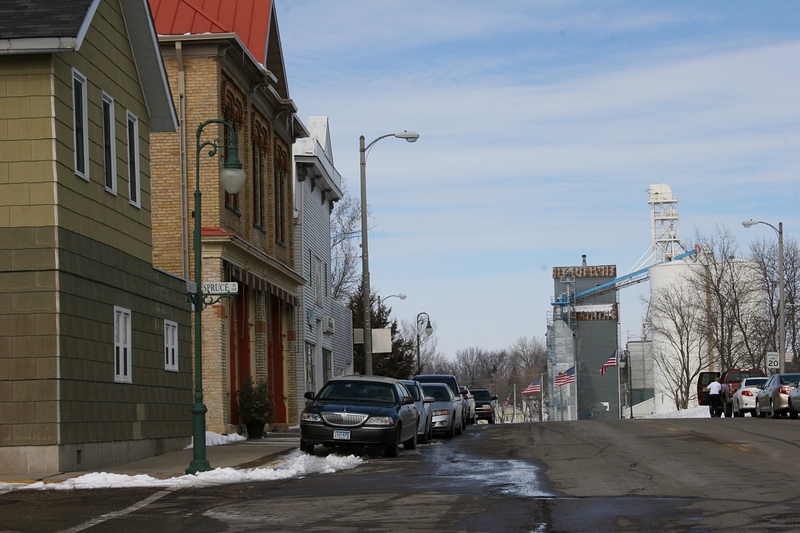 Watch for one more story in my five-part series from this southern Minnesota community. What a wonderful way to honor veterans and so simple!!! Great ideas don’t have to be grandiose at all! And I love the story about the veteran who could move into a mess and make a difference with the skills that he had. Amazing how that worked out!!! Thanks for sharing Montgomery with us! 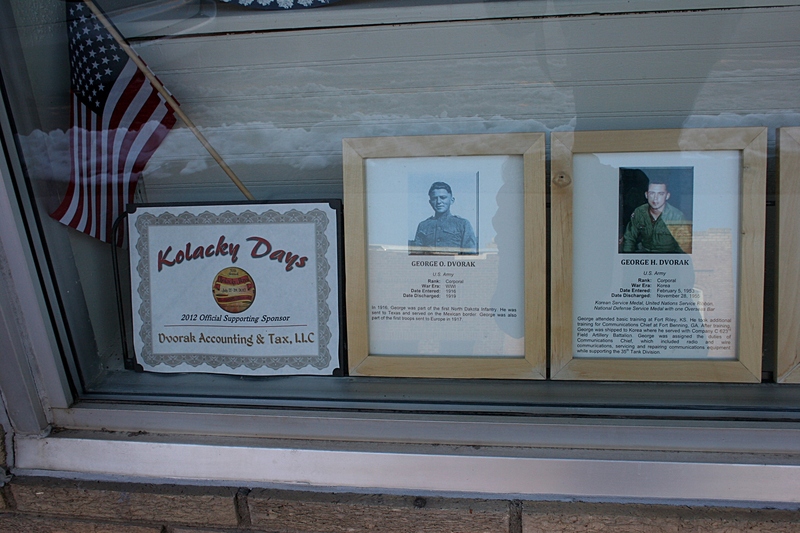 When I saw all those veterans’ photos in the storefront windows and along walls of businesses, I was so impressed. What a novel, wonderful idea, I thought. Unfortunately, I missed the more elaborate veterans’ memorial in the park, which is why I have no photos of that. When John told me about the homeless veteran and how his skills matched exactly what John needed to help his project move forward, I felt goosebumps rise on my arms. John felt the same way. That is so cool! And, yup, “God plans” are so awesome (coincidences…ha!). That’s how I see it, too. The photos that are being displayed is such a great idea. I would be one to stop and read all the pictures I come upon…such a great honor for the veteran and families! I Love the idea of the Harbor, there certainly are some thoughtful and giving people in this world that look for ways to give back! Great stories Audrey! I only had time to read a few of the vets’ memorials. But next time, because Montgomery has so much yet to explore. Discovering heartwarming stories like these and sharing them with you and other readers just makes me happy. You are so great at digging deep – you never take anything at face value and that’s awesome. I bet you were a great journalist. Thank you. I am curious, so I ask, and that’s a necessary trait for a journalist. Listening is also essential. Absolutely, Jim, feel free to link to any and all posts from Montgomery. Thank you and your Post so much for undertaking this project to honor your local veterans. I am impressed.